Have you spent the past decade believing that Canada is nothing more than our friendly, innocuous neighbor to the north? Good—that's what they wanted you to think. 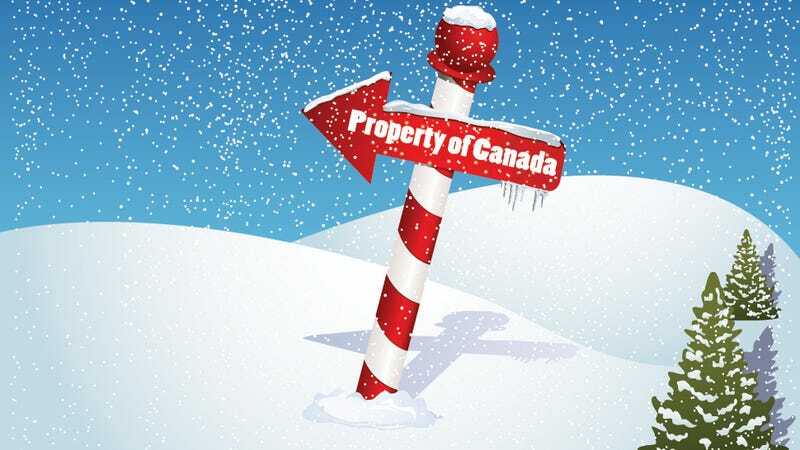 In reality, Canada has given the past 10 years of its life and $200 million dollars in taxpayer money to file the ultimate claim: over 1 million square miles of Arctic seafloor that, yes, includes the North Pole. Canadian imperialists scientists have been working both in labs and on ice camps off the northern shores of Ellesmere Island in an effort to map the Arctic seafloor, part of which it will be laying claim to (under the awesomely named Convention on the Law of the Sea) come Friday at the latest. The decade-long study necessitated the use of both helicopters and airplanes as well as unmanned, remote-controlled submarines that spent days at a time under the black waters' icy surface. Maybe it's simply not worth it. Maybe we said, 'You know what, for the sake of international peace and stability, it's not important. We'll only do our science up to that and that will be the basis of our claim.' [But] it means we didn't go as far as we could.